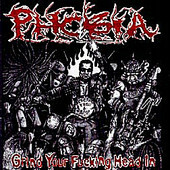 Just in case you began to think that the (under)world of grindcore had all gone over to the math metal scene, PHOBIA unleashes their latest skull cracker to set the record straight. Grindcore is here to stay. This is pure violence with a beat. It is unadulterated vehemence spewed through a Marshall stack. It is chaos captured in the studio. Rarely have PHOBIA sounded so over-the-top* and that, my friend, is saying something. Each of the 17 tracks on this puppy are threats to the seismic stability of the Earth's crust. I once saw PHOBIA vocalist Shane McLachlan roll around in broken glass at a gig* listening to this is exactly what that must feel like. It's gonna shred you.